You are seeing an unstyled version of this site. If this is because you are using an older web browser, we recommend that you upgrade to a modern, standards-compliant browser such as FireFox [http://www.getfirefox.com/], which is available free of charge for Windows, Mac and Linux. In 745 BC, during a revolt in the city Kalḫu that brought the reign of Aššur-nārārī V to an end, Tiglath-pileser III (Akk. Tukultī-apil-Ešarra, "My trust is in the heir of Ešarra") ascended the throne of Assyria, restored order to the troubled kingdom, and set the Assyrian army in motion once again. Although he was a member of the royal family, Tiglath-pileser was not in line to become king. Sources about who his father was are contradictory; one text records that he was a son of Adad-nārārī III, while another states that he was a son of the previous king, Aššur-nārārī V. Nevertheless, he proved to be a very capable ruler. Under his authority, Assyria became a formidable military and political power, just as it had been in the days of Ashurnasirpal II and Shalmaneser III. During his eighteen years on the throne, Tiglath-pileser reshaped the political map of southwestern Asia by mounting an aggressive military campaign every year that he was king. His armies marched in all directions, beginning with the south, where he defeated the Arameans living in northern Babylonia, on the eastern bank of Tigris River. Tiglath-pileser then set his sights on rivals in the northwest and the west. He fought the rival kingdom of Urarṭu and its north Syrian allies; the Urarṭian army was routed and the troublesome Syrian city Arpad was conquered and annexed. With Urarṭu out of the way, Assyria was able to rapidly annex numerous Syro-Palestinian states, including Unqi (Pattinu), Aram-Damascus, and parts of the kingdom of Israel. Conquered territories were efficiently reorganized as Assyrian provinces and placed under the direct control of a trusted official (ša rēši) of the king. Tiglath-pileser also instituted unprecedented large-scale two-way deportations, a policy that transformed the demographic structure and cultural character of Assyria. Moreover, numerous Anatolian and Levantine rulers became vassals. At the time the west was being reorganized, the Assyrian army advanced northward, into the heart of Urarṭu and eastward into Median territory. In the east, rulers, weak and powerful alike, were brought into submission and their lands were transformed into Assyrian provinces. Towards the end of his reign, Tiglath-pileser turned his attention to Babylonia and conquered it. He not only took the traditional title "king of the lands of Sumer and Akkad," but also declared himself "king of Babylon," something none of his predecessors had done. Tiglath-pileser ascended the throne as Babylon's legitimate king and participated in the akītu-festival by taking the hand of the god Bēl (Marduk), a role suitable only for the true and divinely sanctioned king of Babylon. Thus, both Assyria and Babylonia were under the authority of a single king, a situation that would create new geo-political complications, some of which would come to a head in the reigns of his successors. When Tiglath-pileser III died in 727 BC, his son and designated successor, Shalmaneser (Akk. Salmānu-ašarēd, "The god Salmānu is pre-eminent"), ascended the thrones of Assyria and Babylonia; he is also called Ulūlāyu — "(One born in the month) Ulūlu" in royal correspondence and Babylonian Kinglist A. He should have been well suited to performing his duties as king since he had held an important role in his father's administration and since he had presumably been educated as the heir designate. Shalmaneser followed in his father's footsteps, namely by conquering and annexing several foreign lands and cities. His achievements included the conquest of the city Samaria, the capital of Israel (although the nature of its conquest has long been disputed among scholars), and possibly those of Samʾal and Que, kingdoms in north Syria and southeast Anatolia. Babylonia, which he inherited from his father, remained firmly in his hands. Although the details of his reign remain obscure, Shalmaneser appears to have successfully maintained the kingdom, at least for a few years. However, during his fifth regnal year (722 BC), his tenure as king was brought to an abrupt and violent end. Sargon II, Shalmaneser's brother and immediate successor, records some of the details of the internal strife that took place in Assyria at that time, but describes those events in a manner that shows him, and not Shalmaneser, as the "legitimate king" of Assyria. The Babylonian Chronicle states that Shalmaneser died, but does not record the disruption that shook Assyria's foundations. H.D. Baker, "Salmanassar V.," pp. 585-587 in M.P. Streck et al. (eds. ), Reallexikon der Assyriologie und Vorderasiatischen Archäologie 11/7-8. Berlin, 2008. P. Dubovský, "Neo-Assyrian warfare: logistics and weaponry during the campaigns of Tiglath-pileser III," Anodos: Studies of the Ancient World 4-5 (2004-05) pp. 61-67. F.M. Fales, "Tiglat-pileser III tra annalistica reale ed epistolografia quotidiana," pp. 163-191 in F. Pecchioli Daddi and M. C. Guidotti (eds. ), Narrare gli eventi: Atti del convegno degli egittologi e degli orientalisti italiani in margine alla mostra "La battaglia di Qadesh" (Studia Asiana 3). Rome, 2005. A. Kirk Grayson, "Assyria: Tiglath-pileser III to Sargon II (744-705 B.C. )," pp. 71-86 in J. Boardman et al. (eds. ), The Cambridge Ancient History, second edition, vol. 3/2. Cambridge, 1991. K. Radner, "Kalhu, Tiglatpileser's royal residence city," [http://www.ucl.ac.uk/sargon/essentials/cities/kalhu/] Assyrian Empire Builders. London, 2010. K. Radner, "Salmanassar V. in den Nimrud Letters," Archiv für Orientforschung 50 (2003-04) pp. 95-104. 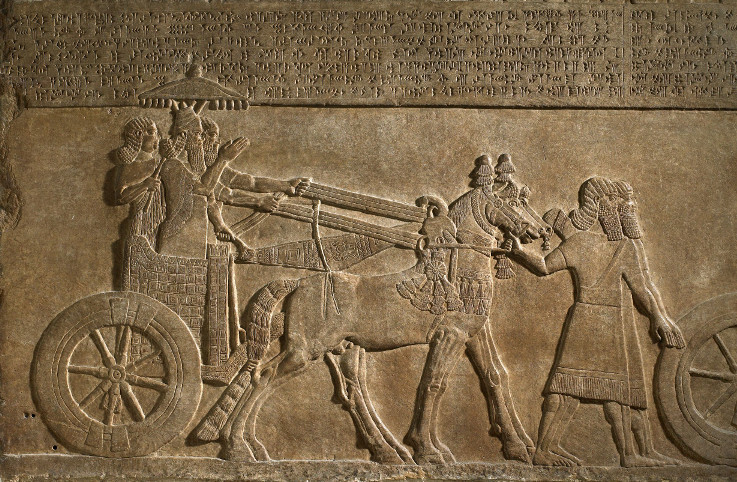 K. Radner, "Shalmaneser V, king of Assyria (726-722 BC)," [http://www.ucl.ac.uk/sargon/essentials/kings/shalmaneserv/] Assyrian Empire Builders. London, 2010. K. Radner, "Tiglatpileser III, king of Assyria (744-727 BC)," [http://www.ucl.ac.uk/sargon/essentials/kings/tiglatpileseriii/] Assyrian Empire Builders. London, 2010. H. Tadmor, The Inscriptions of Tiglath-pileser III, King of Assyria. Jerusalem, 1994. The RINAP Project has been made possible in part by major grants from the National Endowment for the Humanities: Exploring the human endeavor. Any views, findings, conclusions, or recommendations expressed on this website do not necessarily represent those of the National Endowment for the Humanities. © RINAP online, 2011–. RINAP 1 is a sub-project of the University of Pennsylvania-based RINAP Project, 2008-. Its contents of this website have been made possible in part by grants from the National Endowment for the Humanities: Exploring the human endeavor. Content released under a CC BY-SA 3.0 [http://creativecommons.org/licenses/by-sa/3.0/] license, 2007-14.